Looking at the league table and really tight at the bottom of the league. Who do we think will go down and stay up? I see Troon and Kilbirnie have games against each other back to back so they could be huge. Who is safe? Are Cumnock / Buffs safe or will it be over 33 points be safe? Rob Roy seem to be getting dragged closer to relegation zone too. Renfrew are picking up points lately and both Cumnock and Kilbirnie got massive wins. Will be an interesting last 2-3 months. Cumnock safe after that result. 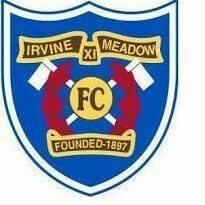 Petershill camby Renfrew down as troon/kilbrinie should have enough 2 stay up. Agree Cumnock safe and once confirmed will allow Paul Burns the opportunity to build his team for next season. After yesterday’s results, and taking into consideration Renfresws I believe anyone from Buffs down are still in the mix. Time will tell! The games are running out for Petershill. 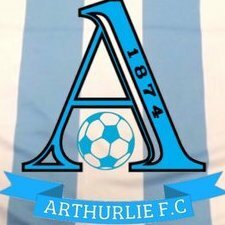 Yesterday's wins for Kilbirnie and Renfrew while Peasy were losing heavily at home again means it's a difficult task for them to get out of trouble. 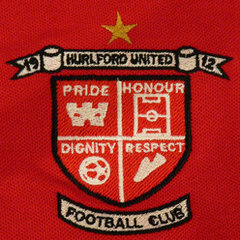 Peasy also have Hurlford and Talbot to play in their last two games. Kilbirnie’s 2 games against Troon are massive as I can’t see them getting anything from the Talbot games. I agree with this. I don't think Buffs or Cumnock are quite safe yet but 3-4 more points should see them safe. If Renfrew beat Buffs next week they are right in relegation mix but a win for Buffs would definitely keep them safe. 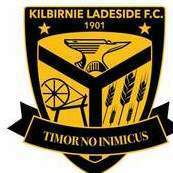 Great 3 PTS for Ladeside on Saturday, huge dunk back to earth when seeing the wins for Cumnock, Renfrew and Troon :(. Be interesting to see how the bookies would price it but I reckon we are probably favs for 3rd bottom looking at the run in. Looking at Kilbirnie and Renfrew's run in I reckon that 32 points will be safety line. Realistically KL need 6 points from the Troon games, but must take at least 4. Renfrew must capitalise on their next three games which are all at home. boys however were superb (especially coming back from 2-1 down!). Rob Roy similarly big game for us before we finish with 3 tough away games at Hurlford, Clydebank & Pollok. one of us is going down! will we do it a whole different question! That was my feeling at the start of the season that 35 would be a reasonable target. My 32 points is based on Renfrew and Kilbirnie winning half their remaining games. As another poster said it will probably be lower, but wouldn't feel safe until I had at least 32 points. 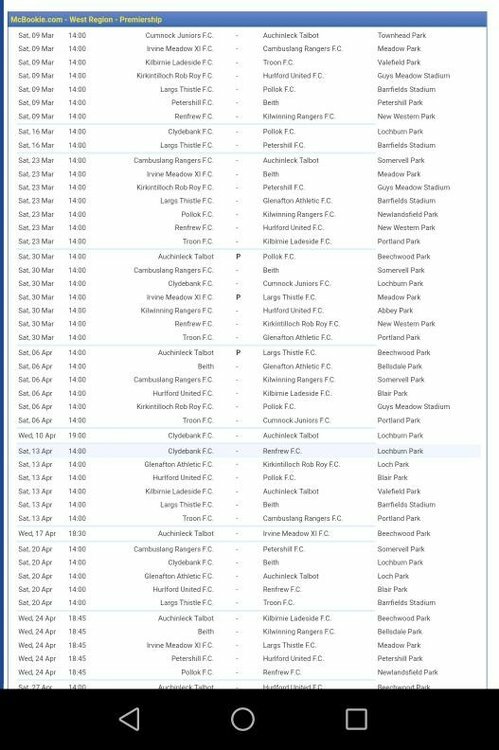 Renfrew, we really need to beat Buffs & Rob Roy at home as H&A v Hurlford & A v Bankies & Lok are tough. bums are well squeaky already! ^^^^ Mate, don't disagree with you, but once a team has 32 points they can start planning for next season or concentrate on the West if they are still in it. 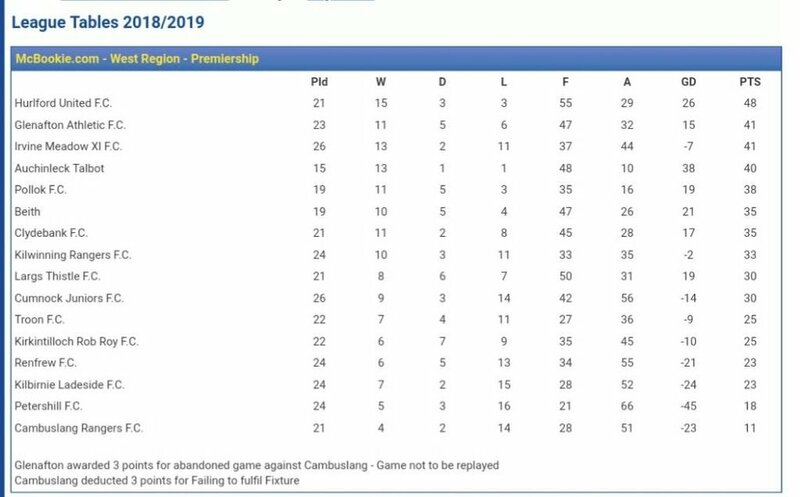 No team can start planning until it's mathematically impossible to get relegated watch kilwinning drop into the danger zone one more win is required on the current form I don't see that coming soon . Buffs are already safe IMHO. Of course, they are not arithmetically safe, but they need to lose 6 out of 6 and Renfrew and Ladeside win 4 out of 6. Going to happen, not IMO. Buffs on 33 points are teams targets when they look at the league another big game for both clubs this Saturday v Renfrew. A sad fact considering last season they got so close to winning the league. Just shows you what that can do to a club.